Josephine Baldizzi arrived in this country as a young girl from Sicily. Her family lived on New York’s Lower East Side from 1928 to 1935, their home a small tenement apartment at 97 Orchard Street. During the Depression, there was no money for Christmas gifts or decorations, so her father, Adolfo, scavaged through their neighborhood for discarded pine branches from other peoples’ trees. Putting his carpentry skills to work, he drilled holes into a piece of plain board and then, using the branches he’d collected, created a Christmas tree for his family. Josephine told the story with obvious pleasure. He would make his own tree, shape it, tie it to the wall, and then get ornaments and dress it all up.There were glass ornaments, some lights and tinsel. For the children, there was a tray filled with traditional holiday treats – marzipan, dried fruits, walnuts, chestnuts, and oranges. It was, she said later, both memorable and magical. Josephine was my parents’ age, and in many ways her story was their story. Still, by the time my parents and I began celebrating Christmas as a family, the Depression had passed. Fresh, fragrant Christmas trees were commonplace, and the excitement of presents was real. If any Depression-era habits lingered, they involved holiday decorating. We cut paper snowflakes for the windows, and pasted strips of old magazines into colorful chains. We spent evenings stringing popcorn and cranberries into garlands for the tree; sometimes we molded tin foil around thimbles, and hung our glittering bells among the garlands. Over the years, increased prosperity brought changes to the weeks before Christmas. More parties were held, and purchased decorations became more elaborate. Competition developed among neighbors seeking to outdo one another’s outdoor lighting displays, and the phenomenon of the ‘must-have’ toy began making parents’ lives miserable. By the time the first before-Thanksgiving Christmas tree lighting took place, we already were on the slippery slope, and sliding fast: toward Black Friday, box store riots, and arguments over which seasonal greeting is most offensive. After my mother’s death, the need to maintain every holiday tradition that had been important to her became less pressing, and I began exploring new ways to mark Advent and Christmas. By chance, a remarkable story from Hong Kong aided that exploration. 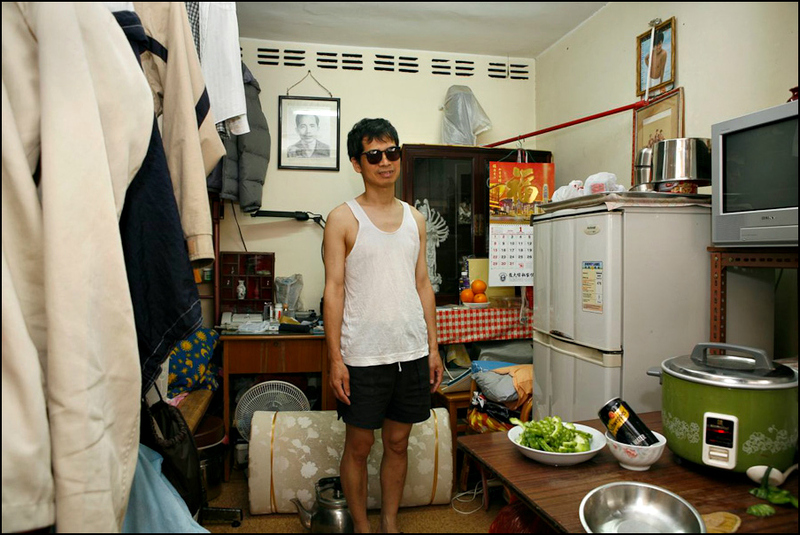 In a photographic collection called 100 x 100, German photographer Michael Wolf recorded the lives of one hundred residents in their one hundred square foot flats in Shek Kip Mei, Hong Kong’s oldest public housing estate. Located in Sham Shui Po, one of Hong Kong’s eighteen Administrative Districts, Shek Kip Mei was the first resettlement estate built after a tragic squatter fire on Christmas Eve, 1953 left approximately 50,000 people homeless. Refugees from Mainland China, they had been living on mixed agricultural and Crown land just north of the Walled City of Kowloon, itself the site of a squatter fire in 1950. While there is disagreement about the nature of the government’s response to the tragedies, there’s no question the beginnings of Hong Kong’s revised housing policies can be traced to the Shek Kip Mei fire. Completed in two phases during the middle 1950s, Lower and Upper Shek Kip Mei Estates comprised forty-two blocks of six, seven, and thirteen story buildings. Redesigned, reconfigured, and renovated over the years, Shek Kip Mei became more livable, but always remained true to its original intention: minimal housing for the maximum number of people. In April of 2007, shortly before residents were to begin moving out in advance of Shek Kip Mei’s demolition, Michael Wolf and a social worker began knocking on doors. An accomplished urban photographer who worked extensively in Hong Kong, Wolf had focused exclusively on building exteriors. At the urging of friends he agreed to move inside, and in the space of only four days he compiled a compelling portrait of urban life. “I had the methodology worked out. You open the door, and you put the camera with one foot of the tripod inside. I used a small flash to bounce off the ceiling. I wanted to see into every corner. I took three or four photographs and moved on to the next one. If someone said no, I didn’t waste any time trying to convince them. The visual impact of the homes’ small size and clutter can be overwhelming, but the words of the residents hardly communicate a sense of deprivation. While taking his photographs, Mr. Wolf asked each resident a few questions: How long have you lived here? What do you do for a living? Do you like living in Shek Kip Mei? Despite differences in age and length of residency, the same good qualities were mentioned repeatedly: convenient transportation, friendly neighbors, low rent, dependable air conditioning. It all sounds so very, very familiar. Today, Shek Kip Mei is gone, nearly all of its residents relocated into slightly larger living spaces within the same District. A single block (Block 41, Mei Ho House) has been transformed into a youth hostel, preserved for its historical value and as a reminder of the resourceful people who lived their lives within its walls. 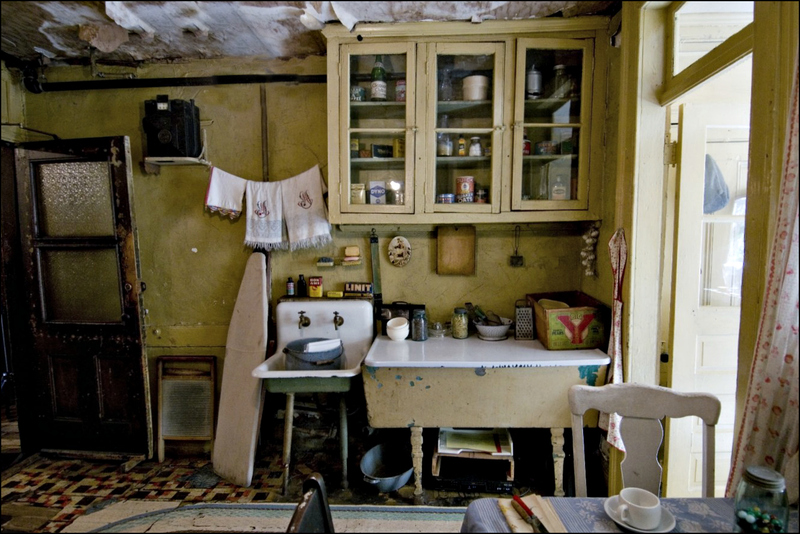 Coincidentally, Josephine Baldizzi’s family apartment also has been preserved: its 325 square feet have become part of New York City’s Tenement Museum. Pondering the Baldizzi apartment and the accomodations offered at Shek Kip Mei, I began to wonder: Exactly how large is a hundred square feet? As it turns out, my dining area is almost exactly 10′ x 10′, if I don’t count a small alcove with built-in bookshelves. It’s an efficient, cozy space. My teak computer desk with its open hutch graces the east wall, a printer and scanner beside it. To the north, a large window presents an ever-changing view of water and sky. Behind me sits a dining table that graced my parents’ home, and two vintage pressed-back chairs with caned seats that my mother restored. Beyond the table, on the west wall, two Mission style cabinets hold antique china; to the south, a small Chinese tea cabinet holds battery chargers, candles, a few skeins of yarn, and piles of instruction manuals I intend to read some day. Most of my at-home waking hours are spent in this space: reading, writing, or tending to business while surrounded by some of my favorite possessions. It’s a comfortable room, but in the end it’s only a room: one of five in my 840 square foot apartment. Granted, I’ve lived in spaces that matched or barely exceeded the square footage of a room at Shek Kip Mei: a Catalina sailboat with less than a hundred square feet of living space, and a hill country cabin that held everything needed for comfort — a woodstove and bed, a propane stove, chainsaws and pumps, table and chairs — all tucked into an expansive 196 square feet of space. Of course, those small spaces were meant to be temporary. For much of the world, 10′ x 10′ isn’t a getaway but a way of life; a routine; an inescapable reality. Today, I have space and light, the luxury of privacy, and freedom of movement. 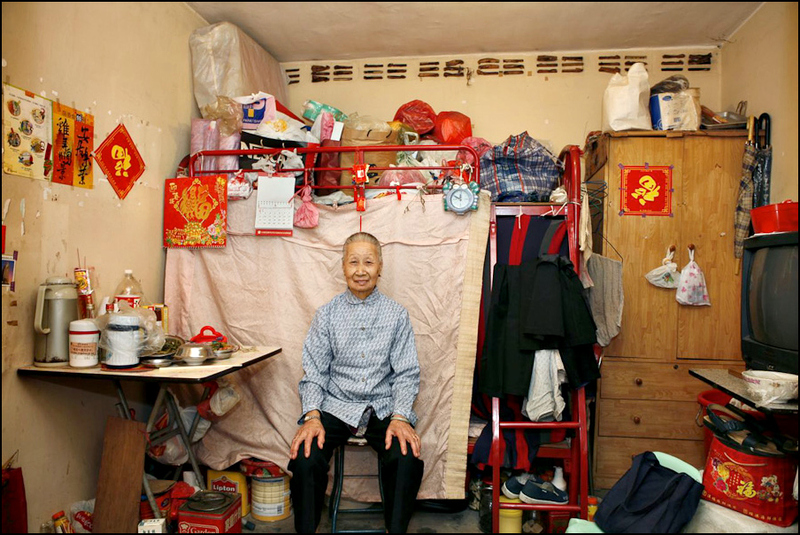 Just across the road, residents of a local nursing home are living out their own lives in one hundred square foot rooms, limited by age and illness as surely as residents of Shek Kip Mei or the New York tenements were limited by poverty and displacement. Elsewhere, crowded into tiny trailers and rented rooms, survivors of California fires and Gulf coast hurricanes continue to rebuild their lives precisely as immigrants to New York, Boston and Minneapolis built new lives a century ago: one step, one day, at a time. Seen from this perspective, my hundred square feet of space feels luxurious as any penthouse, and the creative simplicity of the Baldizzi family’s preparations for Christmas suit it perfectly. Clearing a stack of papers from the tea chest, I light my favorite oil lamp, setting it next to a small forest of burnished copper pines. Warmed by light from the lamp, my grandmother’s ceramic angels peer at me from atop the hutch, seemingly content. As darkness falls and the wind begins to rise, I tuck my tape measure into a drawer, ponder Josephine Baldizzi, and smile at the advent of this new season. Christmas is coming, after all, and its spirit will find a dwelling in even the smallest or poorest of spaces. Comments always are welcome. This edited post originally was published in 2013. < Previous Who’s To Say? A wonderful discussion. The thing that struck me was the lack of windows in the 100X100 photos. I think I could do with small but not without windows. Thanks, Linda. I noticed that lack of windows, too. Like you, I’d find it hard to do without at least one. On the other hand, a quick review of the photos showed most apartments equipped with a television. That’s a kind of window on the world, too. I suppose the view would be a little grim if there were windows. TV will have to do. In the early ’70s, I lived in a tiny apartment in the Texas Medical Center. The ‘windows’ were ceiling-to-floor splits in the brick wall about 18″ wide, and the view was of another building facade. However: from one window, I could look down into Michael DeBakey’s scrub room. That was better than television. You have so many stories, Linda. I enjoy them all. We just recently donated a lot of nice things to a place that provides support to a very poor community. We were told that some of the people even use candles in winter to keep warm. Candles for warmth can be dangerous, but they are effective. It’s one reason I look forward to our cooler winter months, and enjoy candles at Christmas time; it’s too warm for them in the summer. And good for you for thinking of others. Clearly, you do the same throughout the year, but it’s especially appropriate around the holidays. Great story, Linda. I had to laugh looking at photo 5 on the 100×100 Wolf collection. The air conditioning vents were pasted over by MacDonald’s bags. They all seemed to have similar bunk beds and a small TV and refrigerator added for comfort and entertainment .Perfection? The spaces are small but do give a roof and safety. When Indonesia became independent many Indonesian and Dutch nationals were given the option of trying to make a life in Holland. Their old ingrained cultural habits did also include living with a lot of clutter and not wasting anything. They would keep little tins or small jars and would fill the space with odds and ends which would make it all feel like back home (Indonesia). They had a tough time of coping with the Dutch mania for cleanliness, order and scrubbing. After arriving in Australia 1956 we had a hard time and eight of us lived in a Fibro sheeted (asbestos) garage of 8×4 metres. It had a tiny kitchen and we all slept on a combination of bunk-beds and matrasses on the floor. When the house was built we felt like owners of a castle. I used to walk in between rooms to savour space. Christmas is different in Australia. Bare arms and shorts with huge knees showing. Surf boards on the car’s roof rack. Mosquito coils burning in back yards. Where is the muffled sound of snow? The tendency to save anything that might be useful in the future seems also to have been common among people of my parents’ generation. In many cases, it was a natural result of growing up in the Depression and often being without even the basic necessities of life. And there are cultural differences in what a ‘cozy space’ means. One person’s coziness can be another person’s clutter. My Swedish grandmother had some tendencies the Dutch would have appreciated — especially when it came to cleaning — but she drove my mother crazy with her willingness to throw out such items as perfectly good cardboard boxes. You must have felt like royalty once your house was finished. I smiled at your description of the sleeping arrangements. When we were young, everyone’s houses were quite small. When the family gathered, adults got the bedrooms and all of us kids slept on pallets on the floor — when we slept, that is. We usually spent most of the night giggling. My first year in Houston was my first Christmas without snow, and it was quite an experience. Now, I don’t give Santa with a surfboard even a second glance. The day will come when I have to downsize my own living space. The thought doesn’t make me happy, so I don’t think about it. However: I also realized when I read your comment that I had no idea exactly what a longarm quilting machine was. Now, I am enlightened. I also bumped into this article that still has me chuckling. Both you and Melanie might enjoy it. Who among us hasn’t made a mistake like that? That was a funny story. Too bad if she actually buried it in the deep. hmm, that was interesting! I think before I invested $7,000 into a machine like that, I’d try someone else’s machine to see if it functioned the way I imagined. If you’re interested in longarm quilting, I’ll be firing the machine up again in a few days and can show you how it goes by facetime. Let us know if you’d like to. The photographs of the apartments show abundance, not deprivation. You’ve combined the Baldizzi and the Shek Kip Mei stories very well. And weren’t the Shek Kip Mei residents’ answers to the question about why they enjoyed living there interesting? I noticed ‘friendly neighbors’ particularly. I’ve had some friendly neighbors from time to time, but even knowing our neighbors, friendly or not, is the exception around here. Dog walkers, of course, are the exception. I enjoyed seeing the correspondences between life in two quite different cultures, and the similarities with my own. Ever inclined to be tangential, I’ll follow your practice of spinning little stories and tell of an encounter that your mention of 100 x 100 reminded me of. In around 1971, as I walked down an aisle in the Pathmark supermarket in the town on Long Island where I grew up, I heard a mother “teaching” her daughter that “10 times 10 is a hundred, and a hundred times a hundred is a thousand.” The me of today would have said something; the me of back then let it go. The world’s full of teaching opportunities, isn’t it? Whether to seize the opportunities is a different question. Given today’s social climate, you could open yourself up to charges of arrogance by offering the correct answer, and charges of elitism if you tried to explain it. Speaking of that, have you come across Tom Nichols’s book, The Death of Expertise? It was an interesting read. I haven’t read <i>The Death of Expertise</i> but I just requested a copy from the Austin Public Library. Thanks for the recommendation. In the book review I noticed this: “Evaluating teachers creates a habit of mind in which the layperson becomes accustomed to judging the expert, despite being in an obvious position of having inferior knowledge of the subject material.” Generally true, I’d say. Still, a counter-case could be made, especially in primary and secondary schools rather than colleges, that plenty of people in charge of a classroom don’t know their subjects well enough to be there and to warrant being called teachers. Students who go into teaching in the United States have on average close to the lowest standard test scores compared to college students majoring in other subjects. It’s a scandal. Along the lines of presumed knowledge, I’ll trade you books: 50 Great Myths of Popular Psychology, which I read and enjoyed a couple of years ago. Just scrolling through the list of myths was interesting. There were a few I’d never heard of, and a few whose untruth I figured out years ago. It looks like it will be a good read. I took some time to look through the rest of the offerings, and was surprised to even find entries on cameras and photography. I thought so, too. A sense of Christmas is best conveyed with simplicity, I think. It’s one of the reasons I favor candles as a primary Christmas decoration. I would be claustrophobic in most of those 100×100 foot apartments—the lack of a window and the over abundance of stuff to fit the space. Fascinating photo series and it helps me to remember how truly lucky I am. Love the resourcefulness of making a Christmas tree out of pine branches. And the idea of molding tin foil around thimbles to create tiny bells is so sweet. I’ve never heard of doing that. That stuff/space ratio can be a killer. That’s why many (most?) people who live on boats have a storage space somewhere, or tolerant family members, or a friend with a double garage. As for windows, when I first learned about Shek Kip Mei, I spent a couple of days with all of the blinds lowered in my place, just to get a feel for being without windows. My plants didn’t like it any better than I did, and two days was enough. 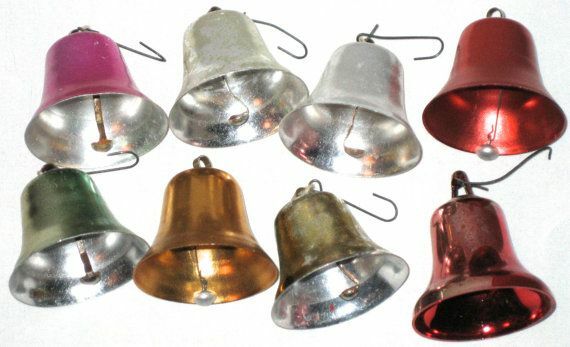 The other bells we used were the small aluminum bells so popular in the 1950s. I still have those, and they hang on the tree every year. lovely, thank you for re-posting, since I was not reading here in 2013! my loss of course. I love that last picture, that sweet icon of Christ and His Mother in a frame. I recognized it immediately. I used to make icons with dollar store frames, it was all I could afford at the time. I often think of this, I live mostly in our livingroom/diningroom/kitchen area, which is bigger I think nearly than all my apartments I lived in when I was single. And we have 3 more rooms. A lot of lessons in this. Thank you. I think that might be one of the icons most familiar to people. It is lovely, and so appropriate for the season. In truth, Dollar Store frames do quite nicely for such things. Their simplicity is a virtue, since the frame doesn’t compete with the image. You not only have your rooms, you have those wonderful windows! The lights from your tree reflect in them so beautifully, and I imagine it’s just as nice to watch the snow fall through them. When I still lived in snow country, there was nothing more pleasing than being inside and cozy, watching the snow fall. Eventually, of course, it was time to shovel, but nothing’s perfect! I’m so glad you enjoyed the post. A blessed Advent to you. Shared bath facilities? Running water or carried in? I could handle small if I were not sharing with someone. One hundred sq ft feet for one is not the same comfort as 200 sq ft for two. I’m really quite into “what’s mine is mine” more than “what’s yours is yours.” Poking fun at myself a bit. I guess Sammy and I could sit on the same sofa again, maybe even love seat size. But a sofa for him and a recliner for me is mighty nice. Sounds like I need a Valentine’s Day make-over. Everyone knows to keep their stuff in their space, too. One captain I know assigned particular spaces to each crew member, and then said, “If I find any of your stuff scattered around, it’s going overboard.” And it did. There was a reason he was known as Captain Bligh. All that said, it is nice to have some space, and not have to share, like two kids in the back seat of a car. Remember those invisible lines, and squabbling about who went over the line? I can just see you and Sammy with an invisible line running down the middle of your love seat. Beautiful and so touching at this time of year. Memories of mum’s Irish family homestead and what it may have been like for my father as an immigrant in Boston for a few years. Picture of Mother of Perpetual Succour, rosary beads remind me of mum & dad. Picture in homestead bedroom and in mum’s bedroom in later years. Thank you, Margaret. Given the mentions of windows in other comments (and my own love of them) I was interested to read that “an icon is not simply an artistic representation. Once it is blessed, it becomes a window to heaven.” I suppose anything that helps us see beyond our limited worlds can become a window of sorts, but a window to heaven is special. I’m glad to have stirred such lovely memories for you. A window to heaven seems like such a beautiful sentiment in this context. There should be more stories like this, especially this time of year. This sentence gives a powerful message that should be listened to by ALL! I suspect that cultural preconceptions shape our view of the rooms in Shek Kip Mei. What can look like piled-up clutter from a distance may very well be a lifetime of collected treasure. Even if the rooms only are filled with the mundane necessities of life, anyone who’s been around people who live in such circumstances — like people living aboard boats — knows that what looks like a mess may be perfectly organized. I had a friend who lived aboard a sailboat for decades, and it was breath-taking to come onto his boat for the first time. But he knew the clutter like the back of his hand,and even better, had it stashed in such a way that he could go out sailing, too. Ah-ha, you’ve seen my house!! People do go through a lot just to survive. Any roof over their heads would be better than none. I am thankful for the life I have been able to live. And in truth, many people thrive in such circumstances: not merely survive. After all, this housing development replaced tin and cardboard shacks on a hillside. What looks like a serious step down to us would have been a very real step up for the residents. The fact that so many continued to return to the neighborhood after its redevelopment is a testament to their affection for the place. I built a 210 square foot cabin in the woods behind our last house. The house itself was small so I built the cabin as lifeboat for our relationship. That way, she had her space I had mine. In the process, I learned just how immense 210 sq ft can be. What struck me about the photos is how disorganized the apartments seem to be. Granted, our 2,000 sq ft house is just as much a mess – but here space counts for less. My comments about the mess speaks to design. Given IKEA and the tiny house movement, we know what can be done, inexpensively, with good design. One wonders why the little tips and tricks of living in such a confined space did not become refined and spread. One supposes that the residents adapted psychologically rather than creatively. I don’t see that as a put down – because people simply create the life that suits them. I think the operative word is “seem.” What looks like disorganization may be something else entirely. You’ve put me in mind of the on-going (albeit gentle) conflict between me and my house boy in Liberia. I organize a kitchen by category: dishes here, pots and pans there, food staples over there. He thought I was nuts, and kept reorganizing the kitchen by function: rice, cooking pot, and spoon here; plates, silverware and cups there; bananas, machete, and rope for suspending the bananas over there. I am certain that what looks like disorganization to us probably is partly due to lack of space, but I also suspect the residents experienced their space as more organized than we might imagine. As for IKEA: spare me. I’ve seen IKEA stores and I’ve been in homes that used them as a model, and — well, I’ll take Shek Kip Mei. I think the homespun make-do decorations and preparations of the struggling are far more authentic than the overdone glitzy abundance we see everywhere now. This is not my favorite time of year. Not a christian for one (actually, I don’t do any religion) but it seems filled with hypocrisy to me, the whole myth of it being the best time of year, that you will get your heart’s desire, only seeing those in need now and ignoring them the rest of the year, etc. the one that particularly galls me is that any tragedy that occurs is somehow worse for falling at this time of year. I think homespun decorations are delightful even for those of us who aren’t particularly struggling. In truth, there are as many Christians as non-Christians who find the commercial aspects of the season obnoxious. I can’t prove it, but I suspect that the resurgence of Advent services and activities in some churches is a reaction against what’s turned into a tide of store specials, too-early decorating, and general merchandising hustle. I’m not so willing to criticize those who are suddenly more attuned to the needs of others around them, though. Hypocrisy afflicts us all in one way or another, and if the season engages us in helping others, there’s always a chance it will carry on into the new year. You know, most of these folks look pretty satisfied, if not exactly comfy. Perhaps one’s living space can be improved (or worsened!) by *who* one lives with! That said, I’ve got to have a window along with a door; otherwise, one might as well be stuck in an elevator. Great stories, Linda, and I love the last photo you included. My mom has that same picture hanging on her wall. That’s such a familiar icon; other readers have commented about it, too. It’s interesting to think about the similarities and differences between traditional religious icons and those we use on our computers and other devices. I don’t believe anyone living in these conditions finds it abundant or comfy or a happy place. In comparison to living on the street, total destitution, sure these cells, spaces, would feel safe. You and all your stuff safe behind a locked door. But no, no one should live without windows, live with their possessions in plastic bags jammed in corners, surrounded by broken down appliances. That’s not an example of reuse or repurpose. If someone cuts off your left hand, you are grateful to have one hand left. That doesn’t make you fortunate. That makes you damaged and left to live without your two hands. Finding something precious to you within your misery is grace. A “broken hallelujah”. You might not find Shek Kip Mei a comfy or happy place, but it’s clear that many of its residents did. Now that it’s been redeveloped (though not precisely gentrified), it’s become a combination of new housing blocks and shops that attract people from all over Hong Kong; there’s a great article about it here. Your post reminded me once again of how much I have to be thankful for. Honestly, a small living space like those endured by many would prove claustrophobic for me. I love my wide open spaces here in my home in the country and I am so very grateful for it. I can think of a few spaces that wouldn’t be at all congenial for me: a submarine, for example. But generally speaking, I can — and have — done small, particularly since the wide open spaces of the country are available simply by heading outdoors. Of course, the smallest space I’ve ever lived in for any amount of time was a 31′ sailboat, which was almost like living outdoors. I was glad for the experience, but I knew it was time to move on when I began longing for closets, and not having to walk to a bathhouse to take a shower. A timely reminder of how many people have to live today. Although the photos were taken some time ago (and what stories those photos tell) there are millions people living in similar circumstances and far worse, all over the world. I have been so lucky in my life not to have to experience anything like this. The most constrained living conditions I’ve ever had to experience occurred when I shared a two bedroom flat (with one bathroom) with six other girls in Bondi, Sydney in 1969. But we had great fun, and got on very well, and we are still friends to this day. Once upon a time, very briefly, I lived in a basement apartment while I was looking for something more suitable. When I look at the photos of Shek Kip Mei, I remember my ‘kitchen’ in that place: a sink, a hotplate, and an electric skillet. It’s amazing how much you can do with one of those things. I looked for other photos of the Baldizzi kitchen, to see what kind of stove they had; whatever it was, it would have been basic. Very basic. While there are complications that arise with living in small spaces or close quarters, there are important lessons to be learned in those circumstances: lessons about thoughtfulness, sharing, acceptance of differences. Maybe we have something to learn from people like the Baldizzis and the residents of Shek Kip Mei — after all, you’re still friends with your flat mates! I too noticed no windows in those photographs. So much of my day indoors is about gazing outside as I work – doing dishes, making a bed, writing at the computer, vacuuming, cooking… but I suppose one can be happy anywhere if one sets their mind to it. I will always remember fondly, the three months Forrest and I resided in a 21 foot travel trailer while we waited for our manufactured home to be delivered. The house in town sold quickly and we had no where to go until our new home was finished. So, we set up the travel trailer/camper on this place (not far from his mother’s house). We stored all of our household goods in a 40 x 60 metal storage building we’d put up years before.Each morning Forrest showered in the travel trailer (which had a ten-gallon water heater) and dressed for work, while I walked to the metal building and gathered the food I needed to prepare breakfast in the camper. I spent the day working on this place, coming back to the camper to fix lunch at noon. After work, I prepared meals outdoors on the grill, while Forrest gathered clothes from the metal building for work the next day. We either watched traffic go by while we visited about the day or we watched a little TV (we had DirecTV in the camper), before retiring for the night. After a month, people told us we’d be divorced living like that. We loved it… it felt more like a camping trip that lasted all summer. What an adventure it was, and we think of the experience fondly after all of these years. Your tale of your days in the travel trailer reminded me of friends who lived on a boat, but were professionals who needed to show up at work looking somewhat presentable. They rented a small office space not far from their boat, where they kept their clothes. Each morning they’d have breakfast, and then head off to the rented office to get dressed and go to work. It was a hassle, but it allowed them to both live on the boat and keep up their jobs. He was a bank vice-president, and I suspect not many people knew what lay behind him looking so spiffy every day. Even though you had a different goal, and the time you spent in the travel trailer was shorter, it makes perfect sense to me that it could have felt like an extended camping trip, and that you recall the time fondly. I especially like the thought of you sitting out at night, just watching the traffic go by. That’s such a down-home image — it’s exactly what we used to do at my grandparents’ house, except there we sat on the front porch. My husband is eagerly pulling out all the Christmas decor & having the best time arranging it all around (& outside the house). I think that if he weren’t around the decoration you described would be right up my alley. Something to make me contemplative rather than manic (which is what all of our “stuff” does – but not necessarily in a bad way). Decorating’s such fun, and I have no doubt that he’s enjoying himself.You’re probably enjoying the process, too. Do you have a rush of special orders for Christmas at work? If you do, I hope you still have plenty of time to enjoy the season. Things are moving fast, this year — I wonder if manic-stricken is better or worse than panic-stricken? The Tiny House movement is touted as a new thing, but it’s really a resurgence of an old thing. The advent of central heat and air has changed the dimensions of our living spaces. Room size used to be limited to what a fireplace could heat, and by the dimensions of trees to make the beams to hold the roof up. In the South, ceiling height was governed by summer temperatures. In convincing ourselves that more is better, we’ve lost our sense of scale. What do we need all that room for? — we just end up filling it up with stuff we don’t really need. Clutter and junk. I do most of my living in two bedrooms (actual bedroom and “office”) with brief junkets to the kitchen. When I was at Crystal Bridges museum, I toured the Frank Lloyd Wright house there. I was amused to be told by a docent that the house — designed by Wright for middle-class Americans — included neither a garage nor an attic. There was a carport for a vehicle, but that was it, because Wright didn’t want to encourage the American practice of collecting ‘stuff.’ I was of a divided mind — where would you put the bicycle and the lawn mower? Still, he had a point. High ceilings, deep galleries, windows and doors placed for cross-drafts: all of those architectural features helped to make southern homes livable. When I look at the McMansions going up all around Houston — especially the tear-down/rebuilds that end up three stories tall and spread from lot line to lot line — I can’t help wondering what the heating and cooling costs would be. Of course, if you can afford one of those houses, heating and cooling’s probably the least of your concerns. I like the photos. It’s interesting to see how people personalize their space, no matter how small. I think I would become claustrophobic! You draw a lovely line from Josephine’s story to your own family’s story, to those who live in the Chinese apartments, and finally to your own precious space. It was like opening doors to new and unexplored rooms, each one different, but with similarites of the importance of home, no matter how large or small. The nesting instinct is strong, isn’t it? And it’s not just a female thing — that’s clear from looking at the photos from Shek Kip Mei. I suspect an interior decorator would look at my space and roll his or her eyes; there is no “theme.” But there’s a lot of history hanging on the walls and filling up shelves. So I have baskets of rocks, old bird nests, and a box of red, white, and blue crawdads. So? I’m constantly going back and forth about changing apartments: downsizing a bit. I certainly have more space than I need. But, I have windows I love, and a view that very few around Clear Lake can enjoy. So, I dither, and declutter a bit at a time as a way of preparing for the day when the move has to take place. A big house would make sense anywhere if there were a dozen kids in the family! And in the past, multi-generational families were more common: kids, parents, grandparents, and assorted other relatives all living together. But those situations are less common today, and you’re right: a reduction in size means a reduction in maintenance costs, in taxes, and in time spent in keeping the place up. Of course, a very small living space — like a van or a sailboat — is easier to cope with when it’s plunked into the middle of the great outdoors! You have pulled all the threads together. My parents came of age in the depression and I still have some depression genes. At this age Husband and I are down-sized and only have a poinsettia on the coffee table as we don’t have a large family to come home. Christmas or the holidays can come wherever you are. You have woven an interesting space into the holidays. Enjoy your space with a view! It’s funny how those Depression genes get passed on, isn’t it? I rarely buy canned peaches any more, but when I did, I always counted the peach halves as soon as I opened the can. My mother did, too; it was a way of calculating just how far that can of peaches would go. As for Christmas coming wherever we are, that’s so true. One of my favorite Christmas memories is waking up Christmas morning in an inn in Salisbury, England, and finding an orange and a peppermint stick outside my door. Few gifts have been as delightful. As my mother reminded me often, “Bloom where you are planted.” It seems rather a hackneyed phrase now but it is true. I do think there is a cultural component to the story and wonder if the big “‘melting pot” that is this grand experiment in the US would be amenable to living in 100 sq feet in a building where individuality is within each apartment. Like some of your other readers have observed, the lack of even ONE window is surprising. Obviously, in 1953, the architect did not think those who were desperate for housing would care. And when you don’t have a home, and one is presented to you, it looks beautiful, I am sure. Linda, don’t think about downsizing. Not yet. It occurs to me that you’re experiencing a bit of the Shek Kip Mei experience yourself. It’s all for a good purpose, but still — disruption is disruption, even when you’ve chosen it. Now that I think of it, the residents of that first big housing estate in Hong Kong at least had the advantage of moving in after the construction was finished. Although the area has been revitalized, with artists, shops, and restaurants moving in, the articles I’ve read note that the gentrification is as much a problem for Hong Kong as it is for many American cities. Housing costs have gone up, of course, and all around the city there are areas where the conditions shown in these photos would be considered a step up. Loved this. Some time ago there was a documentary on the tiny-house movement, in which people gave up their over-mortgaged houses for homes that were around 100 square feet. It was most interesting to see how the space was used. I remember hearing about a follow-up to the documentary, a year or two down the road, and most people had abandoned their tiny homes. I suspect that it is easier to dwell in one when you don’t have an option. Equally important, I suspect, is the allure of “keeping up with Joneses,” or such. A lot of voices tell us that we need more of everything. My wife and I live in a smallish house by standards in our community, but I find it really very luxurious. One day we will downsize. I suspect living in a smaller space will be made easier if it is in proximity to good community, access to nature, and partnered with good health. In the interim, I suspect we would do well to learn how to do with a little less, because that is around the corner one day. Whether it’s easier to dwell in a tiny house when you don’t have an option, I can’t say, but there’s no question that the motivation to make things work would be higher when there is no other choice. I do think that people who take on a tiny house — or even a very small house — because of ideology are less successful than people who make that decision as a natural result of a multitude of related choices made along the way. As for the pressures to consume, they’re ever-increasing, and the availability of easy credit only makes things worse. Of course, as for individuals, so with nations, and especially so for certain politicians. One of these days we may all downsize, whether we want to or not. Sometimes, I think it would be beneficial for us all to experience some deprivation in order to better understand how fortunate we are. I, too, had pondered the size of those 100-square feet homes . . . and wondered how I’d manage. Lovely essay! Of course, even in the leanest times I’ve never been hungry, or cold, or without the basic necessities of life. It’s not that way in many parts of the world, and we too often forget that. I’m glad you enjoyed the post — it was a pleasure to write. I saw a piece on television about Shek Kip Mei just before it was demolished. I grew up in a very small house with six people. We didn’t have a hundred square feet per person. It was fine for me and my siblings, but I’m sure my mother and father were thrilled when we moved into a small ranch house that was built on family property. It felt like a mansion. Still, living in a very small house with others is not quite like living in only 100 sq. feet with all your worldly possessions. And we were not surrounded by thousands of people. When we walked outside, we were surrounded by nature. The thing that impressed me most was that the people didn’t mind living in Shek Kip Mei. They saw the positives more than the negatives. Contentment has everything to do with perspective. I’m so glad you saw that documentary, because you’ve confirmed my sense that Shek Kip Mei wasn’t filled with miserable people. I’m sure most of them would have been happy with more space, or a window, or a real kitchen, but on the other hand, many of them had been living in a shack on a hillside, and got burned out. Perspective is everything. I think you’re right that having some space outside the home makes interior square footage less important. When I lived on that small sailboat, there always was the cockpit and the docks, just as my friends who’ve gone ‘land cruising’ have found two folding chairs in front of their campers or RVs the perfect solution to growing claustrophobia. I’ll bet that new house felt like a mansion to your parents. I remember the pleasure my folks took in contemplating every little detail of the house they built when I was in sixth grade. My dad got his built-in book shelves, and my mother got the slickest canned goods storage closet you could imagine. Little things do mean a lot! I’ve upsized and downsized many times and still have an infatuation for small living spaces. These days, I get that kick from temporary quarters (my favorite being a tent) because I’ve learned that my intolerance for clutter makes a truly tiny home too stressful. Your segues to and from New York tenement, Hong Kong housing, and a simpler Christmas are masterful! It’s true: the smaller the space, the less it can comfortably contain. Of course, obvious as that truth may be, I suspect we’ve all denied it from time to time. Beyond issues of stuff-and-clutter, just having a little interior breathing room is important, too — especially when more than one person’s at home. I’m glad you found the stories fit together well. Just because I can see a relationship among things doesn’t always mean I can manage to make those relationships clear. But I completely restructured this post, and I think its internal coherence improved a good bit. No matter how far apart or how close together they are, it takes much more than walls to make a home. That may be simple wisdom, Terry, but it’s wisdom nonetheless. On the other hand, I did once know a couple who lived in a home so large they often couldn’t find one another. It sounds like a joke, but it wasn’t. They gave up the huge house, and started getting to know one another again. Space to live in. Don’t we have different ideas about what is necessary, depending on our background, culture and of course what we can afford. 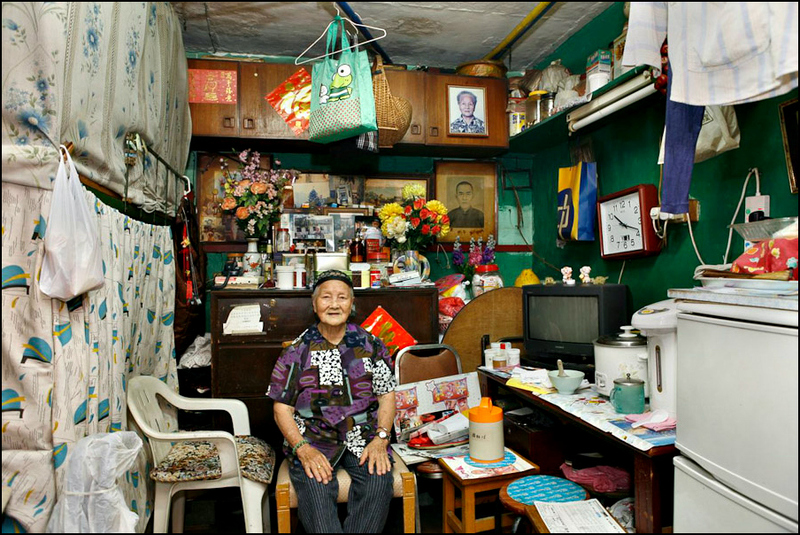 Amazing stories, whether it’s Josephine Baldizzi or Shek Kip Mei – or your own space. That’s good, but you always can stack books on the floor. Once upon a time, I had a couple of end tables and a coffee table made of stacked books covered with pretty cloths. A post of memories – life was and is. Dad had been known to pick up branches at tree lots – we always needed to drill and add a bit of fullness as budget limited the trees we purchased (Pines from the farm were too ordinary – and sneezy for Christmas trees, so we found what we could afford. Growing up we had a house much smaller than my friends, but mom always said we had furniture in all our rooms when they didn’t. I still get branches for wreath-making at the tree lots. Especially at stores like Home Depot, they put their trimmings in a box and they’re free for the taking: a nice gesture, really. I don’t remember using branches to fill out a tree, though. It’s a great idea for a free standing tree, but had we done that, we would have lost the fun of trying to figure out which was the least attractive side of the tree, so we could turn it to the window. As long as the lights were visible from outside, it didn’t make any difference how full or sparse the branches were. I’m with you on the pleasures of a country Christmas. I’ve done urban and I’ve done rural, and enjoyed them both. Still, there is something about that darkness that feels like an essential element. A very beautiful story-and timely too-thank you. You’re very welcome. It’s a good season for stories of home — no matter how humble those homes may be. You’re probably as able as anyone to appreciate the pleasures and uncertainties of establishing and maintaining a home just now — but there’s time enough to deal with all that in the future. I’ve lived in very small spaces at various times in my life and travels, but I value my privacy and light today. I need light and fresh air…….and a Room With a View (after many years of living in damp dark places). Having lived with a Chinese family for 2 years, I can well imagine how the residents in those tiny spaces in Hong Kong loved their community and appreciated their luck in having a good location and a space to call home. I’m glad you enjoyed it, Vicki. It seems that you’ve found a spot that suits you, and it’s certainly one that gives pleasure to those of us who peek in from time to time, as well. Being able to garden as well as you do is really quite special when it comes to urban apartment living. Everything I’ve read suggests that Shek Kip Mei residents may have been short on square footage, but they were rich in community. It’s easy to look at the photos and think only of deprivation, but it must have been wonderful to find such shelter after the devastation that the fires brought, and to share life with others who’d been through the experience. What a great story, Linda. I like the way you wandered all over the world and then came back home. That made me smile. In a sense, that’s been my life story — and maybe the story of most of us. Granted, I’ll never land back in my physical first home, but home is where the heart is — or so they say. Being able to adapt and thrive in a new location can be a learned skill — as you surely know! I think the trend to enormous houses in this country is really a waste and rather sad. I prefer a house that is nice and cozy, at least by American standards. Interesting about the housing in Hong Kong. There has been some similar reevaluation of Chicago’s public high rises, though not everyone is buying it. What’s happening in Houston — well, in our suburbs, too — certainly is a sight to behold. I don’t understand why people with lovely lots want to cover as many square feet as building regulations will allow with a house. Then, of course, the standard developer shrubs go in, and a couple of non-native trees, and it’s all called good: except by neighboring gardeners who watch the three-story house going up next door begin to shade their yards. You always write the most thoughtful things and bring them full circle. You’ve done no less here. Along with being fascinating, this reminds us — we don’t NEED more, we NEED what is essential for our joy, our well being, our — well, our needs. I think you have it in your “room.” The rest is bonus points. The difference between wants and needs is so important, and so hard to sort out. A friend’s husband used to tease her by calling her Ms. Wanna-Gotta-Hava-Needa. She could go from wanting something, to buying something, to justifying her purchase as a ‘need’ so fast it would make your head spin. When we can see that what we so desperately want isn’t at all needful, it certainly makes life easier and more enjoyable. Of course, when what we want are basic needs like shelter, things can get simpler — and more complicated — quickly, especially if those needs can’t be met. I like the way your writing mirrors the topic – it’s not a big sprawling article, but rather a tidy, compact essay, succinct and interesting, and one I enjoyed. I know someone who lives in a rebuilt 1940’s trailer (like a small Airstream, but broader), that he fitted with a tiny woodstove (designed for boats), and solar panels hooked to some used batteries from forklifts. I think he is living a pretty good life in it. Did you ever read Steinbeck’s “Travels with Charley”? I read it a long time ago, and don’t have a copy with me, but I think he met a Navy vet, who’d found a nice spot in Wyoming or someplace, and chose to live far from town, in a small trailer, just the essentials, I guess kind of like living in a ship’s quarters. When I spent a semester at Lingnan U in Hong Kong, I only got to East Kowloon once, and those apartment blocks were already gone, but I saw the Chungking Mansions and the remnants of the Kowloon walled city, which were similar, and the Tai O fishing village, which had pretty spartan housing, too. Not all the living spaces in HK are as pleasant as these pictures, but they don’t have the growing homeless populations that U.S. cities have. After I learned about Shek Kip Mei, I got interested in the fire that caused so much havoc, and that led to learning something more about the history of Kowloon and Hong Kong generally. A friend and her family moved to Canada from Hong Kong many years ago, but she was old enough to have memories of the city, and some tales to tell. I also did some exploring, to see what has happened to the area since the demolition/reconstruction process got well underway, and despite the glittering reputation of Hong Kong, there still are areas of the city where conditions are far worse than in Shek Kip Mei. In fact, by the time I finished reading articles like this, I was sickened. All things considered, I might take life on the streets instead of those cubicles — I just couldn’t endure that. Homeless is one thing — these cage “homes” are something else. On a happier note, I did read Travels With Charley, and enjoyed it. There was a lot I didn’t know about the reason for the book at the time; in fact, I knew almost nothing about Steinbeck except his books, and it would be worth going back for a re-read. I enjoy travel books. Paul Theroux and William Least Heat-Moon are contemporary favorites, but Mark Twain may be the best ever. Mark Twain is my favorite, too. I was in HK to study history, but tried to learn some basic language. By mistake I told the instructor that I lived in a bus stop, when I was trying to say college dorm. He was a very nice man, and immediately said “ that is terrible, I will help you!” It’s funny, but also sad, because of how readily he believed I was living in a bus shelter. But I have seen people in worse situations in US cities. I once knew a guy who was Peace Corps India. His struggles with the language were real, and sometimes really amusing. Who knew that the word for a common spice and the word for a common body part could be so close? Live and learn (and sometimes blush). In a completely unrelated aside, I’m currently listening to the birds at the Cornell feeder in Ithaca chatter and chirr. A friend just passed along the link, and I’ve found it great fun to pull it up and listen to the birds while I work. That’s great! very cheerful to hear those little guys, and I love to snack, too. I’ve walked there a dozen times, they have really good binoculars you can use, and the muskrats in the pond are pretty tame and you can watch them close up. They have a room with recordings of birdcalls, too. Thank you, Derrick. It can be hard to write about such different worlds without judgment or condescension. I appreciate your suggestion that I succeeded, at least a bit. The concept of ‘home’ is really interestingly seen in this post. I took another look at the poem ‘I Know Why the Caged Bird Sings’ by Maya Angelou, although technically one could also feel ‘caged’ in a large home. The way I see it is that the ‘caged’ feeling will always be with us simply because we are in a ‘physical’ world, just as all living creatures are, and that we are tied to a human body which can also be seen as the ultimate ‘home’, eventually. The physical world likes to remind us, set limits and even seems to be accommodating at times, yet the spiritual side is already roaming free in thought, or at least yearning for the moment when freedom comes. That’s at least a hint, a suggestion, that some imprisonment is self-imposed. I’ve certainly known people who imprisoned themselves in anger, resentment, envy, or whatever. Even when the door is open, they’re unwilling to fly. During my mother’s last hospitalizations, she often spoke of wanting to go home. I can be oblivious, at times, so it took a while for me to understand that, while returning to her apartment was part of her longing, it wasn’t the whole story by any means. While I enjoy being ‘at home’ and enjoy returning home after travel, it’s also true — and a little odd — that wherever I am becomes ‘home’ for me. I’ve confused people in the past. Sitting in a hotel bar, I’ll say, “Well, I’m going to call it an evening and go home.” They don’t realize at first that I mean my room — my home for the evening, or for however long I’m there. Shortly before my father died he also spoke of wanting to go home, even though he WAS home. He may have been delirious and for him ‘home’ was another place, not the tangible one at the moment. I agree that self-imposed emotional imprisonment may be worse that plain incarceration. It’s just so much more complex and may be present in an unconscious manner. I also love your recollections of homemade tree decorations. I’ll confess to being happy not to have to try, any longer, to push a needle through cranberries, but aside from that, the substitution of bought glitz for the homemade is a definite step backward from what a holiday should be. It’s a law of the universe, isn’t it — that stuff expands to fill the space available. Of course, the concept of filled space can be elastic. I had one friend who was such a compulsive keeper of stuff that she kept pushing the limits of what we thought possible. In the end, she was grateful for being twice flooded out of her Houston home. As she said, it reduced the need for decision making considerably. A side note that amuses me no end: Frank Lloyd Wright designed his “middle class” homes without either a garage or an attic, the better to keep clutter out of his clients’ lives. On one hand, that seems a bit — presumptuous? controlling? — but on the other hand, we could use a little more of his perspective these days. Of all the decorations we made, the candles were my favorite. I can’t tell you how happy it made me to find Pinterest filled with instructions for making snowball candles with a whipped wax coating, or ice candles in waxed milk cartons. Perhaps civilization will hold on for a while longer, after all. Interesting that a commenter noted that the rooms are windowless. In fact, a window is a luxury. It’s amazing how human beings can adapt, and how life satisfaction is affected and influenced by various factors, social, relational, have proven to be the most important, while the physical is just but one of the variables, and surprisingly, not as important as the others. I think geography plays a role, too. In colder climes, I think it would be easier to live without windows: here in the south, they’re a necessity if there’s no air conditioning. When I visited Liberian and other West African villages and town, even the meanest hut had windows, even though the generally were only openings in the walls. And I’m always interested to see windows in the sod houses on the prairies. Lacking glass, they oiled paper to cover the opening, just to allow a bit of light into the space. That was “the little Christmas card that could,” wasn’t it? I didn’t realize you’d been contending with a postal strike, but I’ll accept your greetings with thanks, and offer the same to you. Has anyone contacted you yet about hosting the Oscars? I think you’d do a fine job, and I hear the position is open! Having lived aboard, you understand how an environment like that is more about creativity than deprivation. What space there is has to be used efficiently — often in three or four ways — but it’s quite possible to live a satisfying life, with everything that’s needed close at hand. Of course there can be complications — like the year our unusual ice storm sealed up the companionway of every live-aboard who didn’t turn their boat away from the wind — but events like that turn into stories: eventually. We do make do with what space we have. I recall living 6 mos. in a tiny compact trailer pulled behind our car across country and parked for periods of time. I don’t know the square footage. The breakfast nook made into my bed nightly. The opposite end sofa made into my parents bed. Two dogs accompanied us. Of course 3 years in a dorm room with a roommate, sometimes without, wasn’t overflowing with space but no cooking. My first working solo was an efficiency apt,, but slightly larger, I think, than rooms you picture. However many rooms we have we end up filling them. Conversely, we seem to adapt to whatever our reduced space. The environment we create is all about our attitude isn’t it! We need shelter, food, clothing for some semblance of security in which we create ways to enrich our lives. Flexibility. The ability to adapt. A willingness to accept something less than perfection, or to put up with the constraints of having to turn a breakfast nook into a bed on a regular basis. All of that’s part of what allows such a variety of spaces to become a home — even temporarily. I’m amused that I’d forgotten dorm living. There, issues went far beyond square footage, and mostly boiled down to learning to live with a stranger. It certainly was quite an experience for only-child me. Of course in those days in loco parentis was taken seriously, and the bonding of a unit of girls faced with a dorm mother who took her job seriously was something to behold. Tell today’s college girls of a time when 10 p.m. curfews and bed checks were the norm, and their heads might explode. But they’d find ways to cope (i.e. : get around the rules) just like we did. If we humans don’t curb our growth rate, this will be the future of more and more people. Having grown up in a modest home with few neighbors, I shudder at the thought of urban living. I’d feel guilty but I know there are plenty of people who shudder at the thought of the isolation I seek. At any rate, you are right that the Spirit of Christmas doesn’t require the shimmer of gold and silver and it would be lovely if we could get off the slippery slope. Another thought occurs to me~you mention that the residents there are content, and kind to each other. Why can our inner city folk not be like that? What is the difference, I wonder, that compels our inner city youth into gangs and violence and drugs? As I think about it, I suppose a lot has to do with our media constantly telling us we need more and more, so those without feel deprivation. Like you, I spend a good deal of my time in one room, about 10×10, the size of a good horse stall, now that I think of it! When I counted up, I was surprised to find that I’ve lived in various urban areas — Kansas City, Berkeley, Houston, Salt Lake City — for a total of fifteen years. Add in my just-outside Houston years, and it’s been forty-three years: over half of my life! When it comes to people, I’ve always found cities just like the small towns I’ve lived in: filled with people who are good and bad, peaceful and violent, congenial and obnoxious. I suspect there were a few people in Shek Kip Mei the neighbors didn’t like, and probably even a trouble-maker or two. But the community spirit seems to have been real. I wondered if there were any books about life there, and I found this one. I presume it’s in English; if it is, I might try to get it through the library. There’s no question that the media and merchandisers are all about encouraging consumption, and it’s also true that those who can’t afford what’s being pushed often feel left out. Another interesting phenomenon written about more and more ofen is ‘Facebook envy’ — the affliction that visits people who spend too much time looking at the perfect lives of perfect strangers on social media, and feel envy, depression, and so on. It’s others’ ability to travel that gets to me, but I’ve found the antidote: stop longing for the places I can’t get to, and visit those I can. Yes, that is an interesting phenomenon of FB, isn’t it? I deleted my account because I felt so uncomfortable with what I found there. It did feel very competitive (I saw this and this species of bird by 7AM…) Now I wonder if I need it to promote my website but I’m hoping not. I’d heard of the depression people feel. I confess, it is looking unlikely that I will get to the west coast, as all signs seem to be pointing to either North Carolina or staying here. And I find it tough to enjoy some of my favorite blogs that come out of the PNW. Like you, I’m surprised when I tally up where I”ve lived. I sure never expected to be in Illinois for 40 years! I suspect Facebook will become less desirable as a platform as its willingness to intrude on peoples’ lives and help governments censor their own people continues to increase. Or, it may be that no one really cares. It’s hard to say. It does amuse me to hear incessant complaints about the platform from people who choose to stay. Of course, I can’t really judge what’s good or bad about it because I don’t participate. It’s funny — when I was growing up in Iowa, I assumed I’d spend my entire life there. That didn’t happen. As the saying goes, I wasn’t born Texan, but I got here as fast as I could. I certainly can’t imagine leaving Texas, although there could be advantages to getting off the coast. I suppose so. I was just this morning feasting my eyes on some images from North Carolina and think I’ll certainly survive if that is where life takes me. :) I would never have guessed it would ever be a possibility. I’m glad you got to Texas. You sound very happy to be there and really, there are risks anywhere. May as well be where you like being. I’m glad you enjoyed the read, and appreciate your taking the time to say so. I have been contemplating this post for the past week from the viewpoint of living in 84 square feet with neighbors ten feet away (who host a social club all hours of the day). They are the ones who invited us to go to Mexico. I’m realizing that my reticence has little to do with the past year’s drama, and more to do with who I am and always have been. A extroverted introvert. The introvert part wins out much of the time, but I’m always friendly and outgoing when with people…you have to be when living in such close quarters–just like those who lived in Shek Kip Mei or the Baldizzis in their tiny flat for all those years. Always amazes me. You said at some point you weren’t looking forward to downsizing. That’s one thing I don’t have to worry about–unless I end up in a tent. It’s only more space from here, and 400 square feet would feel like a football field (for a week at least). I certainly thought about you when I was writing this.Learning to live in such limited space is one thing; learning how to do it while dealing with the unexpected complications of life is something else. Add in neighbors you practically can reach out and touch, and it’s even harder. As I’ve grown older, I’ve come to suspect that the approval of others, or society’s views of what constitutes a ‘good’ life become less important. Sometimes, what looks like withdrawal ‘from’ the world actually is withdrawal ‘into’ more interesting and fulfilling activities. Of course we need others, but some others are good for us, and some are not. Discerning which is which is the beginning of wisdom. As for that hunger for more space? By the time I moved off the Catalina 31, I was lusting after only two things: a bathtub, and a closet. When I got those, life felt pretty darned luxurious, and for more than a week. I was going to mention: it’s not the thought of downsizing that bothers me. I could do that easily. But when I exchange my current living space for another, I’ll lose one of the best views of water and sky there is. That bothers me a lot, and has kept me here longer than perhaps it should have. As it happens, I visited Hong Kong in the summer of 1964, on a singing tour with my college choir. Our guide took us to this estate and I can clearly remember climbing the stairs of one of the taller buildings and seeing the welcoming smiles of the residents as they saw us, and several of them invited us into their personal spaces. I’ve never forgotten the experience, and your post has rekindled the wonderful experience. Thanks for the memories, Linda! I had to grin — in 1964, my high school band traveled to New York and played at the World’s Fair. It’s always interesting to learn where others were in those long-ago years, and what they were up to. That must have been a fantastic trip. Glad to have stirred some memories for you! I enjoyed reading your list of depression era holiday habits that your parents maintained. My family also reused Christmas paper, and we took care to carefully unwrap gifts so that each piece of paper could be saved. I decorated my tree today – and have a lot of old family ornaments on it. One of these ornaments is made out of an old earring. I assume one was lost, and the other transformed into a tree decoration. All of the decorations on my tree have some personal significance, too. I do have some manufactured stars hanging from my tumbleweed, but otherwise none of the ornaments have come from a store. It’s such great fun to pull them out every year — especially since there’s usually one or two I’ve forgotten about. I’m trying to remember when we began throwing the wrapping paper away. I suspect it was when the paper became thin and cheap, and wasn’t that glorious, fancy wrapping that made presents so enticing — even before we opened them. Such an interesting read. I’ve never lived in a particularly small space, except student accommodation, but even then there was a separate kitchen and bathroom. It would bother me, especially without a window. Btw I used to love making paper chain decorations. Paper chains were great fun, if a little messy to make when we were younger. Cut-paper snowflakes always were a treat, too — and making “stained glass” windows with colored cellophane. Small spaces don’t bother me, as long as there’s a window. We’re alike in that. If a separate kitchen and bath are available, it’s even better. One of my favorite shared bath stories involves a stay in London In January, in a place near the Highbury and Islington Station. It was so cold, and it also was my introduction to heaters you had to feed coins into. The only way I could get warm was to go down to the bath and soak in a hot tub of water. The first time I did it, I laughed all the way to my room — the hallways were so cold I “steamed” the whole way back to my room. What an experience. Just lovely. I have a creche made in Mexico, of clay. It goes on my mantel to join the other figures: but they are paper mache and much thinner. The kings and the angels and even Mary and Joseph are well fed and prosperous in contrast to the other citizens. It always seems appropriate. I love the different styles of creche: what they say about different cultures, and the ways they understand what happened on that magical night. I especially enjoy the fanciful figures that sometimes appear. A friend’s children once commissioned a perfectly accurate model of the family cat for their creche. Every year, it crept out and joined the throng around the manger.